There are few things as exciting as moving into a new home. Even with all the excitement, stress can tip-toe in. 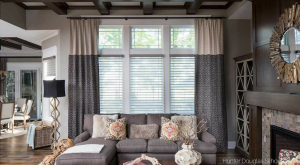 When it comes to choosing window treatments, home owners either rush through the decision, or they place them as a low priority and settle for products that end up causing major problems in the future. When window treatments are chosen carefully and installed perfectly, they stand out for their beauty and functionality. But when they aren’t chosen with much thought or installed with care, they can be a serious nuisance and will cause major headaches. Distract from the beauty and architecture of the front of the home. Don’t fully block the light in your bedroom. Are the same in every room, even though the function of each room is different. Blow wildly in the wind on your porch. Warp, yellow or fade over time. You don’t really like once they are installed. Are too trendy and go out of style in a couple years. So, how do you avoid disappointment? Work with a window treatment expert that can help you customize solutions that will function beautifully and look amazing in your new home. Drapery Street will take all the stress out of choosing window treatments and even do the measuring and installing for you. Just to make things even easier, we also provide temporary shades. This allows you time to shop and make an informed decision without sacrificing privacy during the process. We want you to be happy in your new home, and that’s why we offer a Love It Guarantee. If you don’t love your window treatments, we’ll make it right. And because we are a Hunter Douglas Centurion Gallery, we can offer the very best in products, pricing and expertise to our clients. Call 317-399-1746 to book a complimentary design consultation or visit Drapery Street online at draperystreet.com for more information.